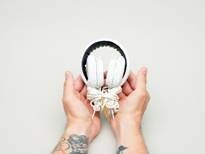 Iconic rock ‘n’ roll brand, Marshall, have announced that the Marshall Major and Marshall Minor headphones are now available in white. The classic black models have been a huge success since their launch one year ago, inspiring this addition to the range. The new Marshall models create an immediate impact with a dazzling white look. With white coiled cords, white ear cushions, and a white ‘Jim Marshall signature’ headband on the Major model, the white Marshalls ooze style, yet still carry the same great price and world-renowned Marshall sound quality and construction. At an RRP of just £99.99, the Marshall Major delivers an on-ear design with in-built mic and remote control compatible with all major music players and mobile phones. These functional features make it easy to control your music playlist, and allow you to answer and end calls at the click of a button. The Major exudes vast amounts of the massive Marshall legacy. The exterior of the headband is made out of the same vinyl used in Marshall Amplifiers and it bears the original Marshall texture. Its coil cord refers to vintage style guitar cables and the plug is a beautiful 3.5 millimetre replica of a classic tele plug, which can be also used with the 6.3 mm adapter included, to plug in to your guitar amp or stereo. Finely tuned by the Marshall sound engineers, the Majors punch well above their weight when it comes to sound, delivering a balanced and powerful listening experience. No matter how hard and heavy the music, the super soft cushions will rest lightly upon your ears, but should you wish to take the Majors off, they are foldable for easy storage and transportation. If the over ear model is not for you, then like the Major, the Minor is an advanced and hard working model, that incorporates the classic Marshall styling into its design. It perfectly replicates the classic tele plug and the knobs found on the Marshall Amps and delivers an enriched sound performance well beyond the £49.99 price tag. The Minor is subtle yet eye-catching. However, it’s got more than good looks. The patented EarClick design ensures that the headphones stay secure in your ears, without having to insert them right into your ear canal. Whether you’re headbanging or slam dancing, EarClick, together with a cable clip and anti-tangle fabric cord, will keep the Minor in place. Combine this with a superb sound performance, multi-size pads to fit all ears, a microphone and remote control for mobile phones / music players, and you know that the Minor is in it for the long haul. Nothing has been compromised with the expansion from the Marshall heritage of big stage performance, to the individual enjoyment of good music. Marshall Headphones are conceived from Marshall’s time-honoured ethos of performance and endurance, designed to thrive on daily use and to render music the way it was meant to sound, no matter what your flavour is.